This Andalucian jewel offers modern restaurants and inviting Sherry bars, not to mention unmissable bodegas. 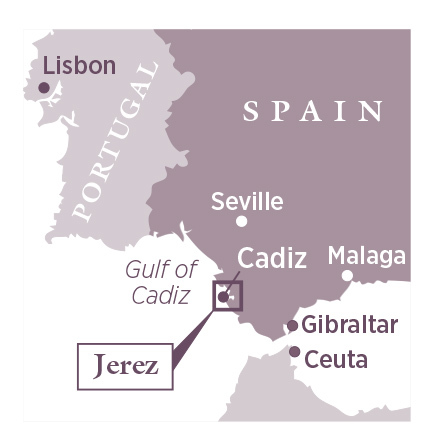 Sarah Jane Evans MW leads the way, in her Jerez travel guide. Main soils more than 90% classified as Jerez Superior. These are the albariza soils: crumbly, porous and limestone-rich. Smaller quantities of barros, clay, and arenas, sand and clay. There’s no better time to visit Jerez than in spring. The weather is warm and the tree-lined streets are starting to reveal the red of the bougainvillea and the electric purple of the jacaranda. The city is busy sprucing itself up for the Feria, one of Andalucia’s great spring fairs (10-17 May in 2015). In 2014 Jerez was European Capital of Wine, and deservedly so. This is a city that has to walk the tightrope between the tourist clichés of flamenco and bullfighting, and the serious business of making and marketing one of the world’s great wines. It has learned the lessons from other successful centres of wine tourism. Today it has good transport connections, a wide range of hotels and, of course, open house at the bodegas. Always book ahead at the bodegas, and if you have a special interest then let them know, as they may be able to accommodate you. Start your visits with one of the smaller ones, partly because it’s more straightforward to understand the processes and the geography of Sherry-making, partly because it can be much more personal. Fernando de Castilla (fernandodecastilla.com) is a great introduction to Jerez with its traditional cellar. Bright white paint on the walls outside, inside it is all shady patios and cellars, with the traditional sandy floors. Its Sherry vinegar is excellent, and worth buying, as is the brandy, not to mention the large range of wines. Another gloriously traditional cellar is El Maestro Sierra (maestrosierra), again with excellent wines. Founded in 1830, it has been run since 1976 by Doña Pilar Plá Pechovierto, now with her daughter Carmen. Bodegas Tradición (bodegastradicion.es) is renowned for its focus on mature Sherries. However, it also worth a visit for its collection of Spanish paintings, from the 15th to the 19th centuries. Next door to the Alcazar is González Byass (gonzalezbyass.com), home to Tío Pepe fino and much else besides. It receives more than 200,000 visitors a year and has developed a diversified range of visitor tours. It’s definitely worth booking ahead, especially if you are interested in a food-matching session. Not surprisingly, the company won an international award for Best Visitor Centre in 2014. It’s also worth making time for a trip to Lustau (lustau.es), another multi-award winning company. Its tours include a 12-wine tasting with samples from the three Sherry towns – Jerez, El Puerto and Sanlúcar – to highlight the differences, and a Professional Sherry tasting, which incorporates food, brandy and vinegar too. After bodega visits, next on your must-do list is enjoying tapas. Everywhere is easy walking in Jerez, since the centre is flat, and everything is close by. There are bars on every corner, each one potentially with better food (or sometimes worse) than the last. Keep moving, unless you find a bar that is exceptionally good. Look at what’s on offer on the counter. Check that the food looks fresh and hasn’t been sitting around curling at the corners. Top of my list are traditional tortilla (potato omelette), tortilla de camarones (shrimp fritters – a speciality of Cadiz), boquerones (anchovies), and the local Payoyo goats’ cheese. Jerez has more to offer beyond bodegas and tapas: churches and cloisters abound; take a bicycle and wine tour (biwi.es); or there are museums for clocks, archaeology and carriages. See a show by the magnificent Andalucian horses (realescuela.org), or visit them at their stud in less formal surroundings (yeguadacartuja.com). Wherever you go, you’re not far from a chilled glass of fino. Make time to spend a day or two exploring the faded glory of the old city of Sanlúcar de Barrameda, one of the region’s other Sherry towns, along with El Puerto de Santa María. Here, the big bodegas to visit are Hidalgo-La Gitana (lagitana.es) and Barbadillo (barbadillo.com). For food, head to the bars at Plaza del Cabildo – Balbino (casabalbino.com) and La Gitana are famous – and Bajo de Guía by the river, where top choices are Poma (restaurantepoma.com) and Casa Bigote. At Bigote’s restaurant next door (restaurantecasabigote.com), get a table by the window overlooking the river and the ferry to the nature reserve of Coto Doñana (info@visitasdoñana.com). Finally, it’s not easy to shop for Sherries in the region, except at the bodegas. Taberna der Guerrita on the corner of Calle San Salvador and Calle Rubiños is an exception (guerrita.es). 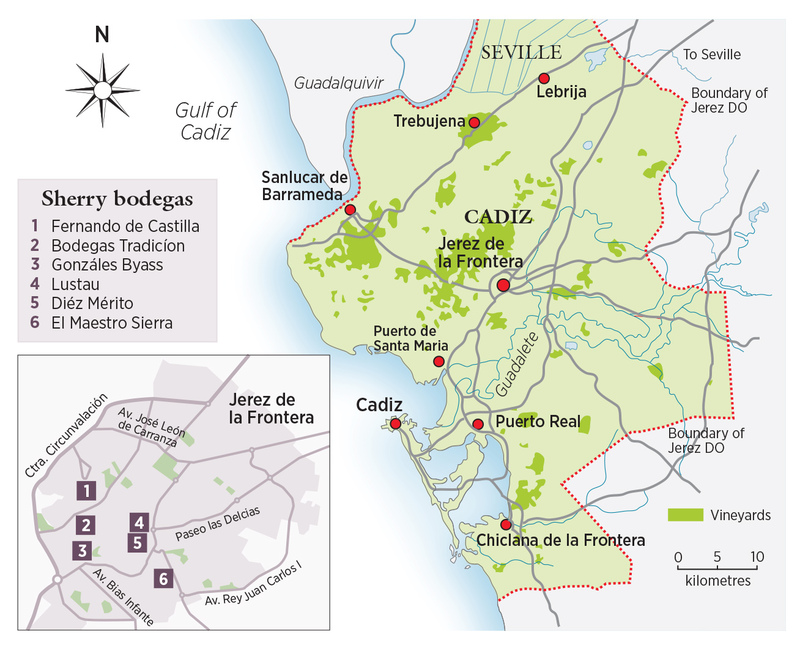 Fly directly (or via Madrid) to Jerez, and then take a train or taxi to Jerez de la Frontera, around 5km away. Alternatively, fly to Seville and catch a train or drive from there (90km).